Woolsey, by contrast, was a key member of the Project for the New American Century — a neoconservative think tank largely founded to encourage a second war with Iraq. Woolsey signed a letter in 1998 calling on Clinton to depose Saddam Hussein and only hours after the 9/11 attacks appeared on CNNand blamed the attacks on Iraq. Woolsey has continued to insist on such a connection despite the complete lack of evidence to support his argument. He also blames Iran. He chairs the leadership council at the Foundation for the Defense of Democracies, a hawkish national security nonprofit, and is a venture partner with Lux Capital Management, which invests in emerging technologies like drones, satellite imaging, and artificial intelligence. 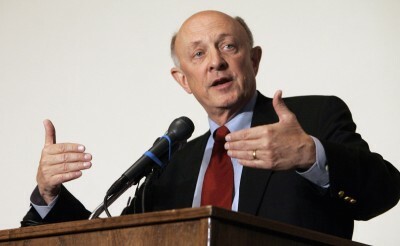 Woolsey went on CNN on Monday and said that he was principally motivated to support Trump because of his plans to expand U.S. military spending. Trump gave a speech last week in which he proposed dramatic expansions of the Army and Marines, and hundred-billion-dollar weapons systems for the Navy and Air Force. He offered no justification — aside from citing a few officials who claimed they wanted more firepower. Woolsey stood by Trump’s proposal on Monday. In the past, Woolsey has publicly disagreed with Trump on a number of national security issues — including Trump’s plan to ban Muslim immigration. On Monday, Woolsey told CNN that such a plan would raise First Amendment issues, but that he supported a temporary immigration block from certain Muslim countries.